First and foremost, it is very easy to install and setup the MongoDB. 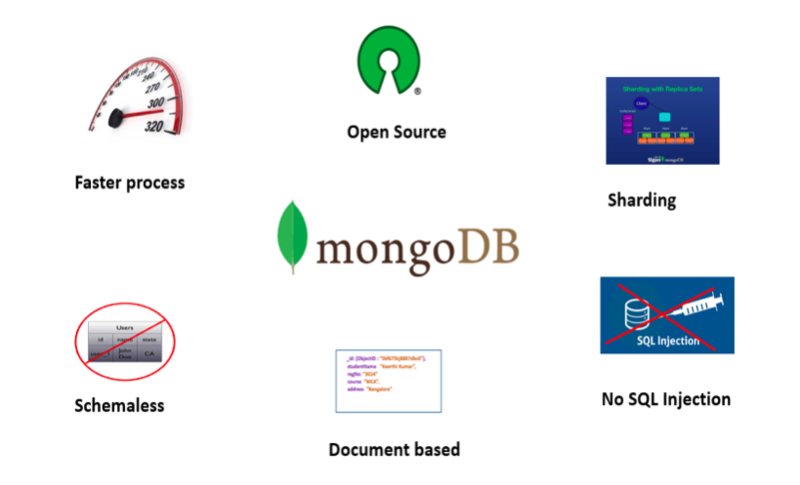 The very basic feature of MongoDB is that it is a schema-less database. No schema migrations anymore. Since MongoDB is schema-free, your code defines your schema. The ability to derive a document-based data model is one of the most attractive advantages of MongoDB. Because, the way it stores the data in the form of BSON (Binary JSON), ruby hashes etc, helps to store the data in a very rich way while being capable of holding arrays and other documents. The document query language supported by MongoDB plays a vital role in supporting dynamic queries. Due to the structuring (BSON format - key value pair) way of the data in MongoDB, no complex joins are needed. Performance tuning is absolutely easy compared to any relational databases. No need of mapping the application objects to the data objects. Enables faster access of the data due to its nature of using the internal memory for the storage. Since, it is a NOSQL database, then it is obviously secure because no sql injection can be made. MongoDB can also be used as a file system, which helps in easier way of load balancing. MongoDB supports, the search by regex and fields as well. MongoDB can be run as windows service as well. Good amount of documentation is available. MongoDB does not require a VM to be run. MongoDB follows regular release cycle of its newer versions. The support for Sharding is one of its key feature. Sharding is the process of storing the data in different machines and MongoDB&apos;s ability to process the data, as and when the size of the data grows. This results in the horizontal scaling. With sharding, more amount of data can be written and read back as and when there is an increase in the data growth.